I didn’t waste any time getting to the office this morning due to an early morning appointment to show an investor a vacant home which was recently listed for sale. As many times it has been on and off the market over the years, today’s showing was the first for me. That poor house was a classic example of an over-improvement of a cheaply built home that was likely constructed back in the 1880’s. For sure it was one of those typical “shotgun” houses that offered the modest of living quarters for immigrant families who just needed a place to start a new life, but over the years and likely after multiple owners, there were two shed roof additions added which throws off the balance of its original design and appeal. After walking thru the interior today, I could see there were even all the more cheap improvements on the interior. The kitchen was updated, but with very cheap cabinets, and a main floor 3/4 bath added that definitely needed work. What I thought to be odd, was the lowering of the ceilings on the main floor with a newer style wooden wainscot, but the lowering of ceilings in those small rooms created an even more cramped feeling. After my buyer did his inspection of the basement, he decided there was too much un-doing and re-doing of something that didn’t even have good bones, so that was the end of our walk-thru, and we both agreed that whomever does end up owning it, will likely have purchased it for a low price, then glossed it over with cheap paint and floor coverings, and afterwards turn it into another one of our City’s low-end rentals. Now if I were one of the neighbors, I would buy it and then scrape it off so to make their yard larger. Since I was exceptionally busy these past days, I didn’t have time to read anything in the Globe Gazette, but today I took took a few moments to go thru it, and when I stumbled upon an article written by John Skipper which was published March 30th, I took time to read it. The article is named, “Mason City Bats: A lesson in good intentions”. Oh mercy me! How is it that all of a sudden someone who’s been a drum beating proponent of the Renaissance Project, is now turning into a questioner? He was very clever by not coming right out and saying anything specifically negative about it, but got his message across by comparing something unfortunate that happened back in 1994. I not only read it, but also re-read it just to make sure I didn’t mis-interpret his message. Nope. It’s there for everyone to read between the lines. How in the heck is it that there’s someone who has held so much power-of-the-pen in our City for all these very many years, and at this late in the game, finally realizing that the likelihood of that arena being a self-sustaining entity, is little at best likely? Whatever happened to good ole research being done by intelligent people who are in the know about the long-term feasibility of something of that scale way before a shovel of dirt is moved? What scares me all the more is seeing something like that monster un-finished build-out blighting Charles City’s Main Street which must’ve looked good on paper, but certainly didn’t have the takers. As one of my very intelligent old family members used to say, “Willful waste will certainly bring woeful want.” And to think they’ve already started tearing into the guts of the old Penny’s building. As I’ve said before, I really want the best for our City, but I can’t help but sense there are dark financial clouds on our horizon after that civic center project is completed. I continue to hope and pray I’m 1,000% wrong. 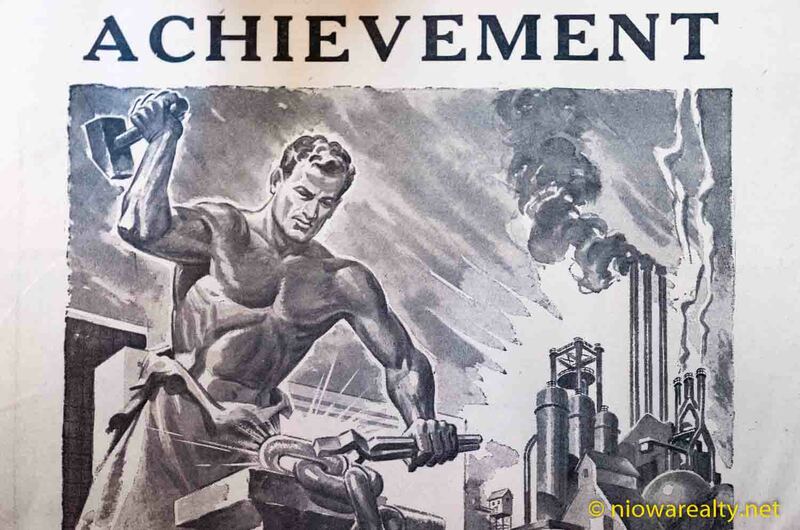 The above photo titled “Achievement” is yet another I took of a page from our Globe Gazette’s 1953 Centennial Edition of Mason City. I was only able to get the top portion of it, and if wondering why it was published, the lower portion was promoting the names of all the many of our local unions at the time. Tonight’s one-liner is: Ignorance can be improved; willful ignorance and inaction is inexcusable.